Electrical service entry wiring, service entry cabling (SEC), & the electrical meter: how to inspect for & report service ampacity, service entry defects & hazards. 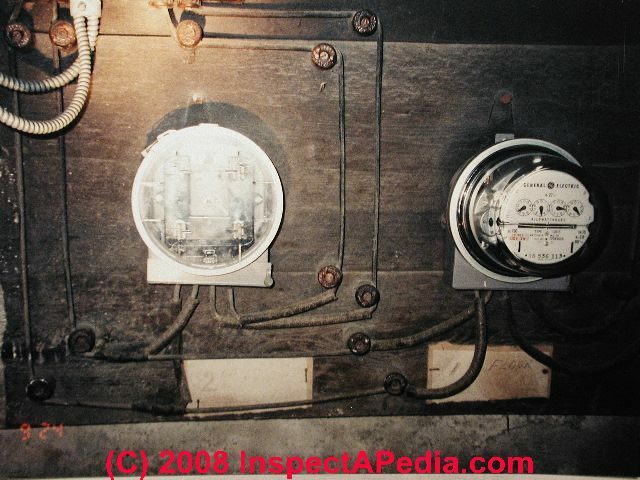 This article series discusses procedures for safe and effective visual inspection of residential electrical systems including electrical panels and other components, when the inspection is conducted by trained building inspection professionals, home inspectors, electrical inspectors, and electricians.
. 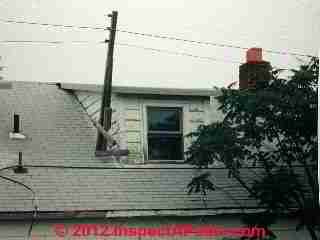 In this case the house was being used to support electrical wiring that was in turn bringing power to a separate home located nearby. 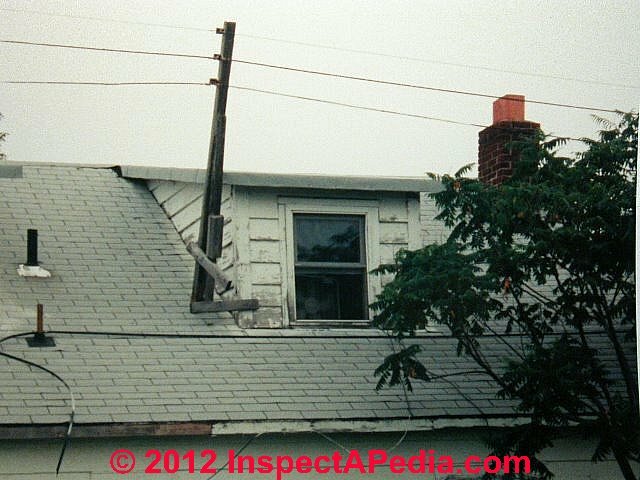 Electrical conduit joints outdoors must be weather tight - note the damaged electrical conduit, open connections, incomplete conduit, wiring exposed to weather and water at our mobile home electrical inspection photo shown at left. 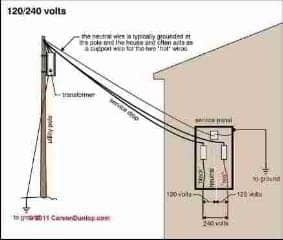 Readers of this section should also see ELECTRIC METERS & METER BASES for details of additional unsafe electrical service conditions that can be spotted from outside the building. A study by the author showed that very common sources of water leaks into and damaging electrical panels include frayed SEC, leaks at the top of the meter, and leaks at the building wall where the SEC passes from the bottom of a meter pan into the building electrical panel. 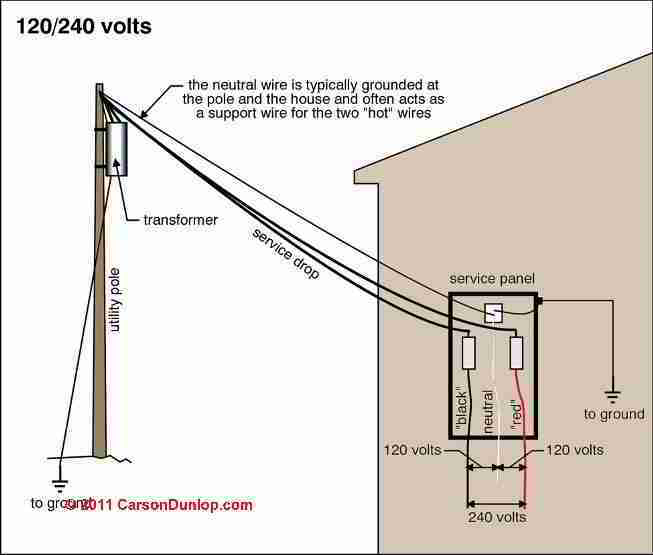 for a detailed article on how to determine the amps and volts of a building's electrical service. So what determines the actual service ampacity at a building? Ampacity of an Electrical Service - Details of how to determine electrical service ampacity and voltage by visual inspection and/or safe use of test instruments. Inadequate / marginal total capacity for the modern use of the building. Some lenders require a minimum of 100A. Some utility companies will not replace an old 60A service (and meter) and will require that service be upgraded. 2016/09/06 I am hoping to get some suggestions. I power cleaned a drain and felt mild electrocution in my hands. I further discovered the ground from the outlet in the home had current. I flipped the main breaker and ground still has current as does the panel box itself. The city has an old wiring system where neutral is ran back through the power line. Ground to neutral connection outside the main panel is not allowed. Home has 200 amp service ran through 2/0 stranded copper SEC. However city line is aluminum half as thick. Main transformer blew power to the block when I started pulling close to full 200 amps. Continue reading at XAMPS VOLTS DETERMINATION or select a topic from closely-related articles below, or see our complete INDEX to RELATED ARTICLES below. SERVICE ENTRY WIRING & AMPACITY at InspectApedia.com - online encyclopedia of building & environmental inspection, testing, diagnosis, repair, & problem prevention advice. Questions & answers or comments about electrical service ampacity determination for buildings.